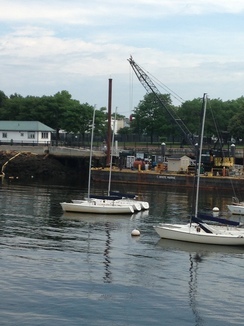 Finally, MassPort seems to be finished with the resurfacing of the pontoon at Piers Park Sailing Center and we will be able to access the boat. 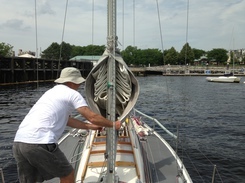 Sunday, we go a ride out via the launch at the Shipyard. 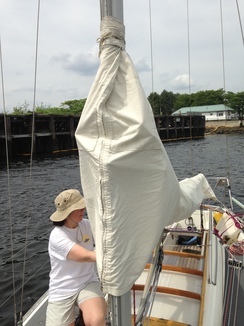 Elizabeth and I measured the mainsail for a new cover. Found the really old cover, the one we got with the boat, fit pretty well. Off it goes to Francois to be used as a pattern for a new one. The top image is the repair crane alongside the pontoon. Sonars are rafted on moorings until the pontoon is ready for students and members. 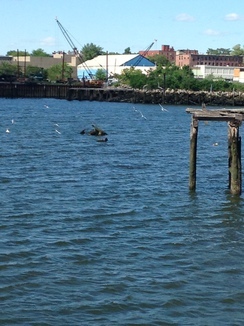 Below: Terns nest in the old pier and fish the nearby waters. It is a scene to see them suddenly lift off their nests and swoop down on schools of minnows. Then, in a flash, they are back on their nests and quiet.